We had a couple of inches of snow in our area last Friday. This was our deck during sunrise Saturday morning. The beach is always different, but she never disappoints. Last weekend, she was wearing white. Neither of us had ever seen snow on the beach. 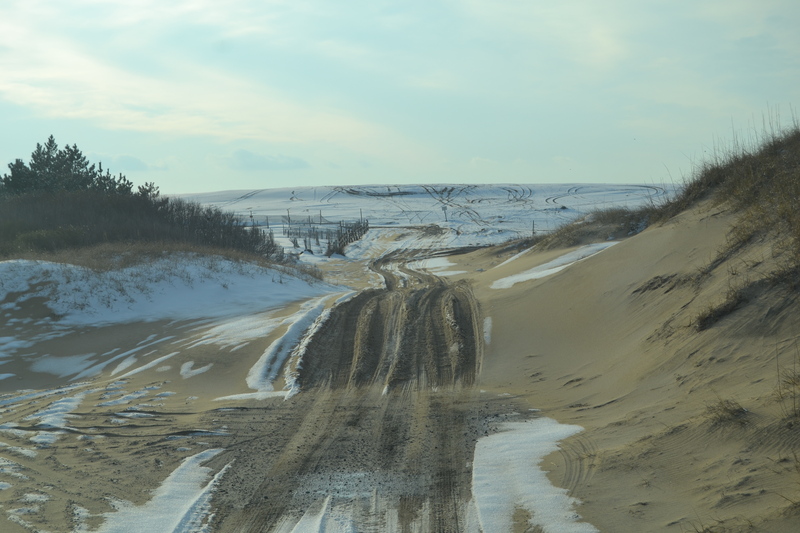 It seemed strange to have sand and snow side-by-side. Leaving the flat surface of the beach proved to be even more challenging than usual. But our trusty little Jeep didn’t let us down. We only saw a few horses on this trip. These three were beside one of the canals. The water was an odd color. In this picture, it almost appears to be frozen over, but that wasn’t the case. 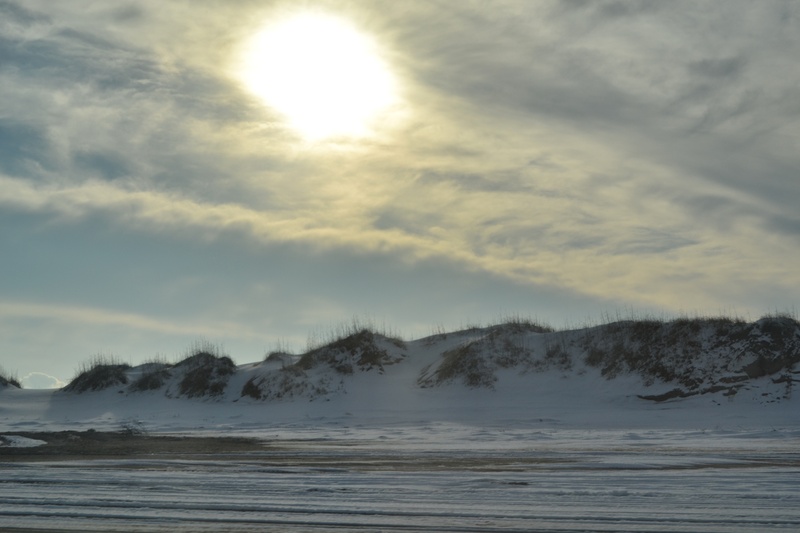 We always enjoy our drives on the beach, but last weekend, the snow and late afternoon sun made for some especially beautiful scenery. Tomorrow, more pictures from our spur-of-the-moment trip. 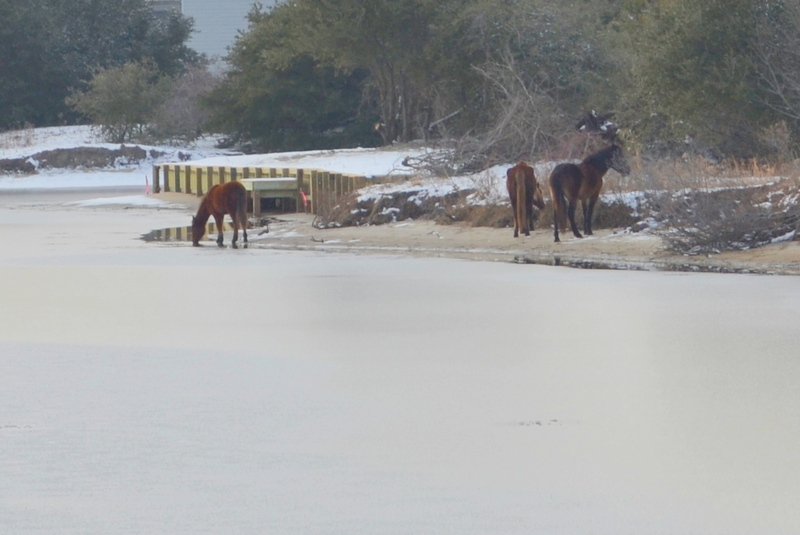 This entry was posted in OBX Wild Horses, Traveling Days and tagged obx in snow, wild horses of corolla. Bookmark the permalink. Your pictures are stunning! How awesome it is to see snow next to sand. Dianna I just love love love this post! And I am liking Motor Man’s spontaneity too. I much rather like to take off for a day trip or road trip on the spur of the moment. How fun! 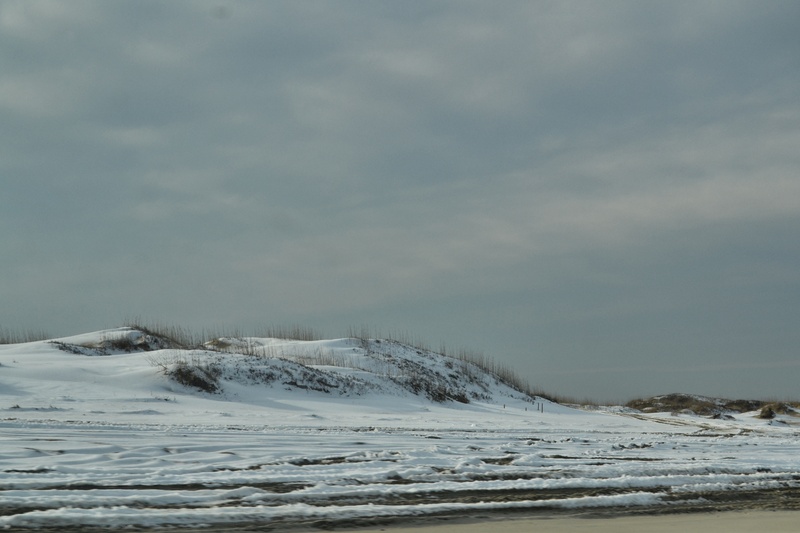 Thank you for sharing your pictures of the wintry OBX!! What grand photos! I’ve never seen snow on a sandy beach either but it’s magic…..glad you and MM had the chance to enjoy that wintry beach on the spur of the moment! Lovely pictures of your snowy beach. I bet it was a wee bit chilly though!!! mm, i love how he thinks!! how was lunch?? gorgeous images of my very most favorite place in the whole wide world!! 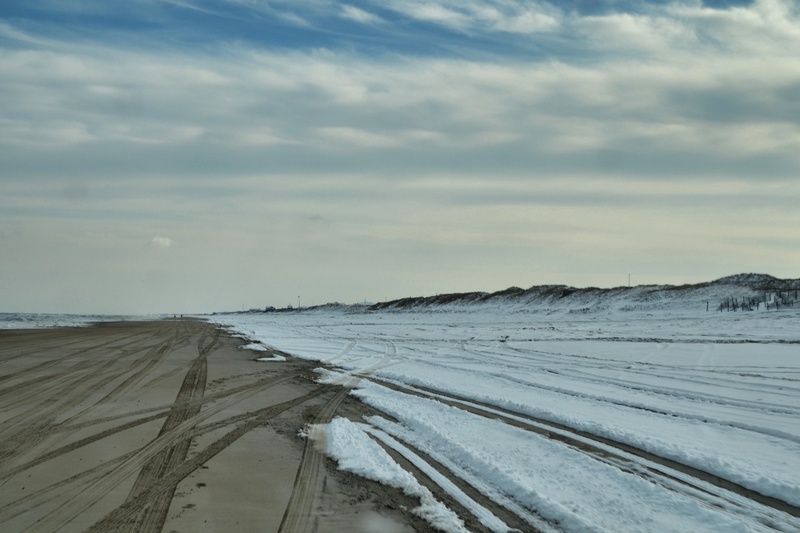 Beaches and snow definitely go together…just don’t see them together that often. Did you go to Corolla to see those horses. Corolla is only two hours away from us, but we can’t see the horses unless we rent a four-wheel vehicle. Maybe some day we will do that. I love the pictures of the snow in the beach. If it ever snows on a weekend, I’ll have George take me to get pictures. I don’t like to drive with snow on the ground, but George doesn’t mind. A fine series. I’ve never seen snow and sand together before. I like the addition of animals to these beach shots. Awesome photos! I have never seen snow and sand either and the combo is almost ethereal. How lucky you are that Motor Man is so adventuresome. And I love it that you got the horses enjoying things too. A great post Dianna! One more person here who’s never seen snow on sand! Thanks for capturing and sharing; I’m looking forward to tomorrow… Bravo on the last pic! How perfectly beautiful! Your photos could easily be used in some touristy platforms to draw more people to the OBX, but why spoil the peace and quiet and beauty with a bunch of tourists… Thanks for just sharing them with US! Except for the sand dunes (and horses! ), looks kind of like Lake Huron in winter. To take the place of awesome wild horses we’ve got icebergs that come in and out with the currents from time to time though 😉 and that’s kinda cool…Doesn’t come close to seeing wild horses though! MM is such a good guy. Stay safe and dry in your stormy weather out there. I’ve never seen snow on the beach. Awesome! Looking forward to the rest of your spontaneous jaunt! Oh Gosh! Now I really am homesick for Vancouver Island! Really remarkable photos! 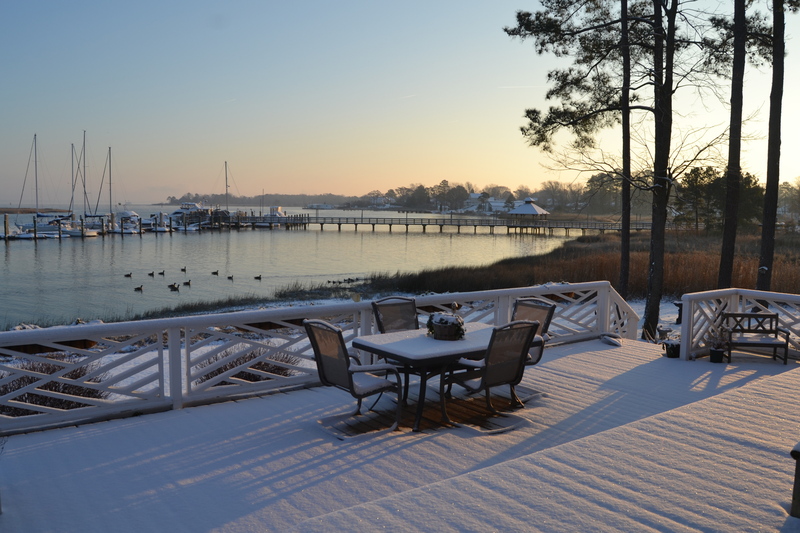 I’ve never seen snow on a beach and I appreciate your sharing these…thanks! Beautiful pictures, Dianna! That Motor Man is something else!